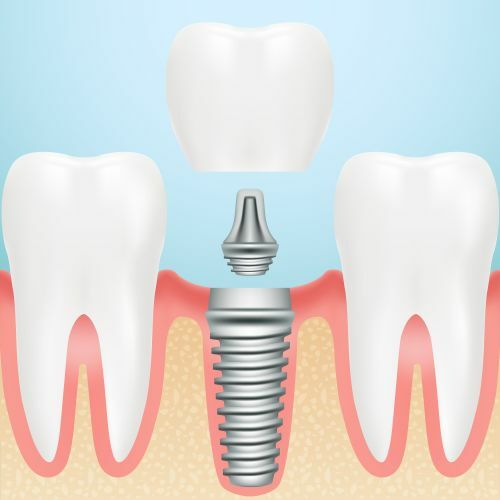 Dental Implant Haverhill MA | Restore your missing teeth with dental implants. This artificial titanium tooth root supports your dental crown while preserving the jawbone. Dental implants is one of the three forms of teeth replacement, but it is favored by patients for its stability and permanency. Implants are inserted into the jawbone, like a natural tooth. When healed, an abutment is screwed on top to hold the dental crown. This teeth replacement procedure is not removable, which allows patients to treat them as natural teeth. Maintenance only requires normal brushing, flossing, and routine dental visits. Why is jawbone a consideration for dental implants? Implants need thick and sturdy jawbone for successful attachment. Unfortunately, tooth loss can weaken the jawbone, which requires bone grafting before the procedure. A weaken jawbone may require a patient to choose an alternative teeth replacement procedure, like a dental bridge or dentures. Patients with dental implants preserve their jawbone from further loss as well. Dental implants are not painful to perform. We use a local anesthetic to keep you comfortable. And, we recommend over-the-counter medication for mild discomfort you may have afterwards. Will I have my dental crown placed that same day? The dental implant area needs to heal beforehand. It could take about 4 to 6 months for full recovery. During the waiting period, we will insert a temporary crown. Your permanent crown is being made during the recovery time. Dental implant surgery is a safe procedure. It has been performed now for over 30 years with predictable successful results. During your exam and consultation, we will review your medical history to ensure the procedure will not cause complications. For example, patients with uncontrolled diabetes and hyperparathyroidism may need to consider other forms of teeth replacement. Contact us today to learn more! Call (978) 373-1231 or book an appointment online now.